So, this week I got the chance to meet the other #RoadFromRyerson bloggers and chat about the good and the bad of graduating. Things that may have been hiding under the surface. Things that we could share with our readers. Things that would help us really take you into our lives. So I’m going to be blatantly honest and share the good and bad moments and I’m going to start and end with what I consider good. But along with the thrill of graduating, while the stress of classes disappeared a new kind of stress took its place. I had focused on getting through classes so much that I hadn’t focused on having a job ready to go. Seeing the majority of my graduating friends posting statuses about their new jobs was not helping much either. I always thought or hoped I’d be one of those students who would just know what they were going to do and be ready to go right at grad. But, after writing my last exams I was not sure what I wanted to do. I felt disappointed that I didn’t have my career together, and confused as to how all the hard work I had put into my career thus far could have possibly left me feeling as though I was starting from scratch. Searching for a job and trying to make something work immediately, made me feel as though I was grasping at straws. With this pressure I was putting on myself, and the confusion I felt, I could not think clearly. But then, a story I had read a few times in my news feed came to mind. 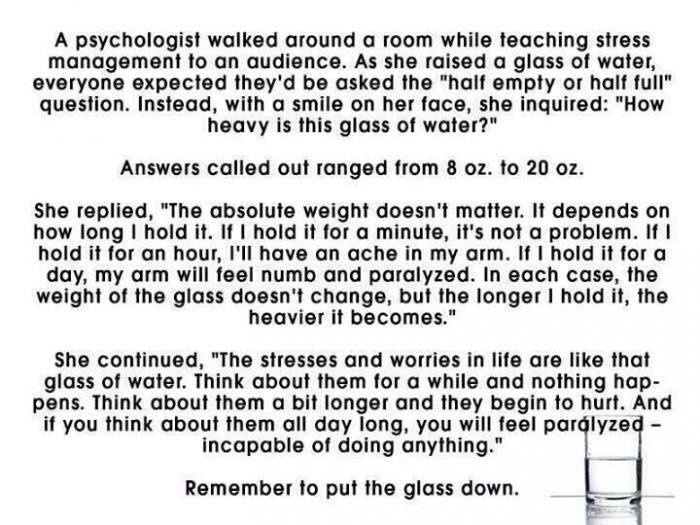 And it reminded me to put the glass down. I have time. Many people have been telling me to enjoy this brief vacation time I have before I start working, because I’ll be working for the rest of my life. Coming to Ryerson I fell into the entrepreneurial mindset, and I wanted to do everything early so I could set up a great future for later. But I know if you love what you do, it’s no longer ‘work’. And I believe the best part of taking the time I need and that I have, is that I know I’m going to make better decisions that resonate with who I am and the kind of world I want to be a part of and help build. Comparison is the thief of joy. Another quote you’ve probably read. We’re all on different paths and I have begun to acknowledge and remind myself that I have nothing to prove. That in itself takes a lot of pressure off me. I’ve learned a lot about myself throughout these past 4 years and I’ve realized this learning and personal growth never stops. In this constant state of learning, we’re actually all the same. We all contribute to the bigger picture in a way that only we can. Look at the bigger picture. This one was ingrained from years of art lessons and I was reminded of it while catching up with a prof this week who commented that I like to approach things holistically, “big picture”. I’m confident in who I am even though my career seems very confusing at the moment. Right now that’s all I need. What I’m meant to do and where I’m meant to be is like a lighthouse in the distance, drawing me toward it. Even if it is turbulent at times, I believe things will fall into place and this turbulence is ultimately only temporary. I have my whole life to figure it all out and it’s only going to happen once I clear my mind and appreciate each moment for what it is… So, if you are going through something similar, remember to put the glass down. Take it easy on yourself – you are human and you are doing your best. It will all come together. See what the others are up to! Previous ArticleTHOMAS PYPER | When I Grow up…Next ArticleSARAH JOAQUIN | Because I’m free… free falling.